Description: Red, blue, and black power leads this early Conrail freight south (then officially east) on a bitterly cold late afternoon. LV 310 GP38AC became CR 7656. Already through the paint shop, CR 6596 U36C was ex-EL 3325. PC 7834 GP38 became CR 7834. Description: Ex-CNJ 2512 leads an eastbound mixed freight. Description: An empty Conrail UFS passes through East Linden Interlocking on its way back to the coal mines in the Clearfield, PA area. Description: At this time, this Conrail hopper train was a westbound. In a later time, the line would be changed to a north-south classification. Description: Loaded coal train passing under the Susquehanna Trail. Description: The westbound freight is about to enter the Allegheny Divison Zone B. Description: Boxcar number 565 of the original Norfolk Southern Railway on a westbound freight holding on Fair Siding is being passed by the eastbound freight's lead locomotive. Description: By MP 271, later this location would renumbered MP 242. Description: Leader of coal train stored on Linden Siding in a snow flurry. Description: Coal train stored on Linden Siding in a snow flurry. Description: Southbound (then officially eastbound) coal train going through the wye at Linden in a snow flurry. Description: Southbound (then officially eastbound) coal train passing the Freighthouse. Track in foreground was the Watsontown Secondary before CP-WAT Interlocking was installed. Description: Ex-Reading leader still shows its Reading striping on its pilot on this northbound freight. Description: This eastbound freight is stopped on Muncy Siding while a westbound freight passes. CR 6084 is ex-EL 3619. Description: This freight train has old converted PRR passenger cars for work train service at the head end. Description: This freight train with old converted PRR passenger cars for work train servce at the head end pass the Watsontown freight house, another railroad structure long since demolished. Description: At this time, this was a westbound freight. The crossing is the PA Rt. 44 crossing. 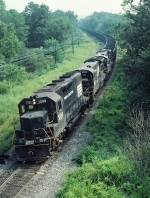 Description: This westbound freight is crossing PA Rt. 44. Description: This westbound freight is waiting on Muncy Siding for another westbound to pass. Description: Ex-PC 2367 leads an empty westbound hopper train past another westbound freight led by ex-RDG 3646, stopped on Muncy Siding, waiting for it to pass. Description: With the year 1980 and engine number 1980 the same, "KEEP IT MOVING WITH CONRAIL!" slogan was applied to this engine. Description: Eastbound freight, the unoccupied parallel track is Fair Siding. The siding going into the woods went to a coal grinding facility, long since shut down. Description: Eastbound coal train, CR 3649 was ex- RDG 3649. Description: It was a very cold and windy day with snow showers. The train is running on former PRR track. The other track was the former Reading Main from West Milton to Newberry, now a stub track ending where a gondola is seen in the distance. Description: Appalachian Trail crosses Conrail's Buffalo Line. Description: It's a rainy day and Conrail OCS Susquehanna Valley Special with 2 E8As and 7 business cars is on a trip from Harrisburg to Williamsport with area business leaders to promote economic development in the valley.